September gave us a brief reprieve from the nearly two year-long black fog of pessimism that has been enveloping our country. After nearly 20 months of being bombarded with an endless march of negative economic news, many Americans grew more hopeful in September due to soothing words from many economic commentators and analysts. Many people declared that the worst was now behind us and that the US economy would start to grow once again. 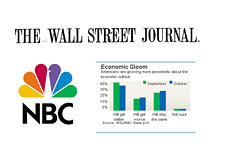 According to a WSJ/NBC poll, 35% of people polled in September felt as though the economy had hit bottom, which was a striking improvement over previous months. In addition, 52% of people polled in September felt as though the economy's slide still had further to go, down sharply from 58% in July. As mentioned, after a brief blip higher in September, people are starting to feel more negative about the US economy once again. 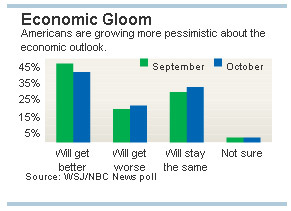 29% of the people surveyed in October felt as though the economy has bottomed out, down from 35% in September. 58% of the people surveyed in October felt as though the economic slide still has a ways to go, down from 52% in September. It's hard for people to continue to be optimistic when the national unemployment rate continues to tick higher with each passing month. Many Americans are having a very tough time making ends meet and just don't have any extra money in their pockets right now. It's hard for people in tough situations to be excited about the prospects for the economy twelve months down the road. In addition, the constant drumbeat of a weakening US dollar and crippling national debt load can't be helping the psyche of the average American right now either. The confidence of the average American in their economy has been absolutely crushed over the past two years, and it is going to take much more than an upswing in the stock market to reignite any widespread optimism.